Because of the celebrations around the 50th anniversary of Martin Luther King’s ‘I had a dream’ speech, a small but powerful photographic exhibition in central London contains some of the most evocative images I have encountered from that time. Trolley Books are hosting the show Marching to the Freedom Dream at their TJ Boulting gallery. 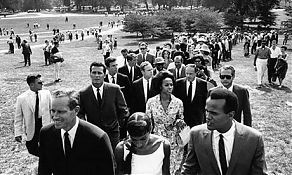 It consists of several black and white vintage prints by the US photographer Dan Budnik, who chronicled the Selma to Montgomery civil rights marches as a long-term project for Life magazine in 1963. This is familiar territory, not least to anyone familiar with Bruce Davidson’s epic series Time of Change: civil rights photographs 1961-1965, but Budnik made me think again about the dogged nature of the struggle for civil rights and the extraordinary sense of optimism that fuelled it. Alongside his images of marchers, jubilant, defiant and exhausted, he catches King as we have seldom seen him – his suit and tie replaced by casual clothes and a peaked cap, looking more like a soul singer than a preacher. In one almost abstract image, King’s outline, blurred and distorted, is reflected in a pool of water. In another, an American soldier snaps to attention and salutes the Stars and Stripes as it is carried past by a black youth. There is another intriguing image that speaks volumes about the spirit of the times. 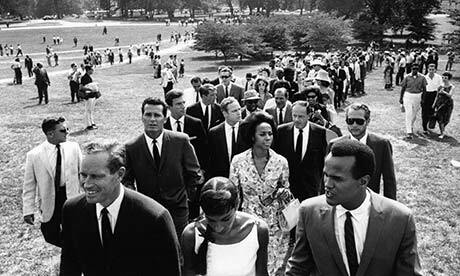 Budnik captures a throng of famous faces in the so-called “Hollywood delegation” as they cross the Mall towards the Lincoln Memorial to hear King’s historic speech. Among them are Harry and Julie Belafonte, Marlon Brando, James Garner, a bearded Paul Newman and Charlton Heston, the latter having not yet embraced far-right Republicanism and the National Rifle Association. In another evocative image, a young Bob Dylan and Noel Paul Stookey, of Peter, Paul and Mary fame, flank a strikingly beautiful Joan Baez as they sing a freedom song for the assembled marchers. The exhibition coincides with the launch of a Kickstarter campaign to fund publication of a book of Budnik’s civil rights images.